So many people can spend hours and hours on end watching their favorite TV series, documentary, or favorite movie, especially during weekends or holidays. In front of the TV, people could just sit down, relax and savor the time they have to catch up on their favorite TV fare either alone or in the company of friends or loved ones. Its great to watch your favorites on any TV, but more so when the TV is bigger and clearer. But what would make the experience better is if the audio quality is just as spectacular. For the discriminating Filipino consumer, its not just about the crisp clarity, vividness, and lifelike superiority of video and images that matter; the richness and fullness of the accompanying audio also matters. Sharp Philippines Corporation, one of the countrys leading and trusted appliance brands, understands Filipinos search for top-notch audio-video quality for their home entertainment appliances. That is why the company offers to all Filipinos the Sharp AV Rack (ARS-300W). One of the Sharp AV Racks best features is its multipurpose quality. 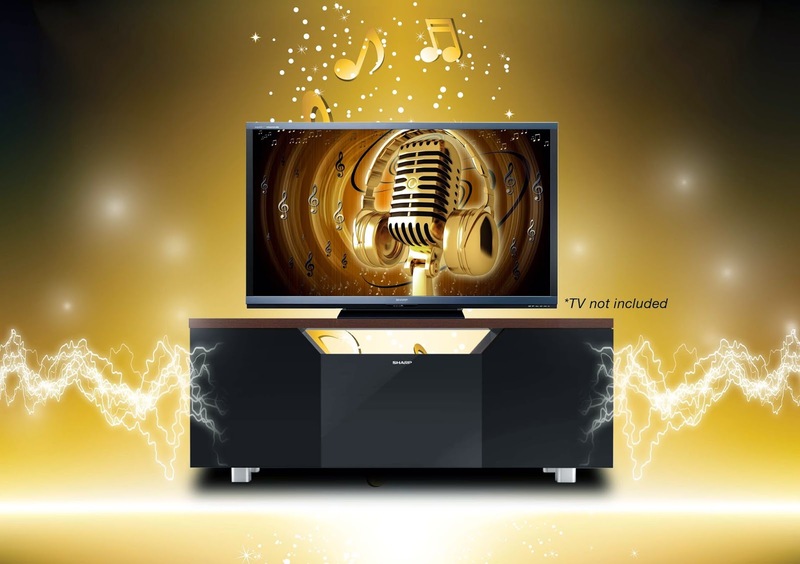 Not only is it a simple TV rack for TVs up to 42-inch (with up to 40kg load capacity), it also acts as an instant sound system. With its 6,000-watt Peak Music Power Output (PMPO) audio power, the Sharp AV Rack is sure to fill the room in with superb sound superiority. It acts as a 2.1 channel speaker for your TV to make sure you will never miss anything from what you are watching, especially your much-loved sci-fi movie or series. The down-firing subwoofer will definitely make you enjoy all the booms and the bangs as it offers glorious and chest-rattling power of pure bass quality. Even without turning on the TV, you can still enjoy the aural glories of the AV Rack. Besides its technologically first-rate audio quality, the Sharp AV Racks elegant design with Wengue brown finish makes it a perfectly stable TV rack. The Sharp AV Rack is a good addition to your modern homes aesthetics, whether in the living room or if youre chic enough, probably in your own home theater. If you get tired of watching TV and would prefer relaxing to cool sounds, the USB multimedia function of the Sharp AV Rack lets you play your favorite music from your removable file storage device. Its built-in AM/FM tuner allows you to enjoy local radio programs on air if youd prefer to listen to music or news in enhanced and crystal clear audio. Despite its modern touch, the Sharp AV Rack does not have the complicated features that most sound systems have. Its AV input and output terminal lets you plug in your big screen TV, DVD player and even your game console with ease, without having to worry about tricky installations, complicated wirings, and other things that would require reading a user manual. The Sharp AV Rack is ideal for Filipinos who are looking for cost-effective ways to enjoy complete entertainment at home, without compromising on quality. It is also a perfect solution for families who live in smaller houses and apartments. joy pure entertainment as it makes bonding time with all of your family members or friends while enjoying a movie nightor even videokea truly endearing experience. And because its Sharp, a brand that has been providing the Filipino market with superb home appliances and electronic devices for more than 30 years, expect the Sharp AV Rack to provide you with benefits beyond your expectations. Sharp AV Rack is just one of the many engineering marvels that Sharp is offering, another proof of its commitment under the Our Brand, Our Pride philosophy to uplift Filipinos quality of life through exceptional products.